This is a fabulous transferware ointment pot or crock, circa 1880. 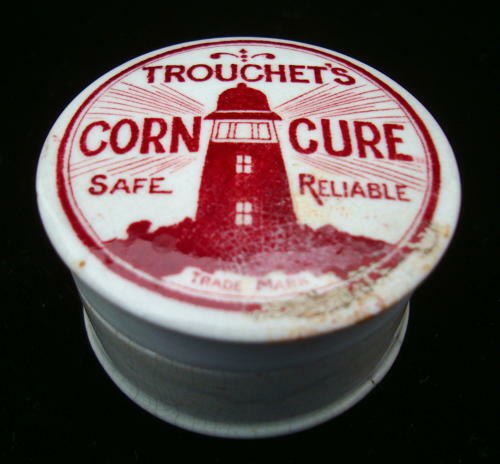 It once contained a miraculous salve for the Cure of Foot Corns. This ointment was made and sold by a family of Chemists, well known "snake oil" salesmen in Australia. The product was shear quackery. The transfer is in rare Red. The small crock stands 1 1/4 " tall and 2 " wide. It is thinly potted with a precision cut rim and crisp, finely applied transfer. It is in good condition, glaze rubbing to the outer rim and darkened age lines to the base. A rare find.